Dr. Eugenio A. Sierra, 1760-1849, was baptized on 23 November 1760 in the parish of Nuestra Senora de La Asuncion in the diocese of Salamanca. His certificate gives his date and place of birth as 15 November 1760, just a week earlier, in the town of Valero, province of Salamanca. The town is west of Madrid and southwest of the city of Salamanca. His parents' names are given as Manuel Sierra, born in Valero, and Teresa Pazos, also born in Valero. His paternal grandparents were Francisco Melchor de Sierra, born in Madrid, and Antonia de la Rua y Perez, born in Salamanca. His maternal grandparents were Francisco Pazos y Figueroa and Anan Sanchez, both born in Ciudad Rodrigo, Salamanca. Eugenio Sierra received medical training in Spain, probably Cadiz, and then went to the New World arriving in Pensacola about 1785 where he began work in the military hospital. According to a family tree in the possession of a descendant, Eugenio had three siblings: Gertrude de Sierra, Isabel Sierra and Francesa Martina de Sierra. This information has not been verified. 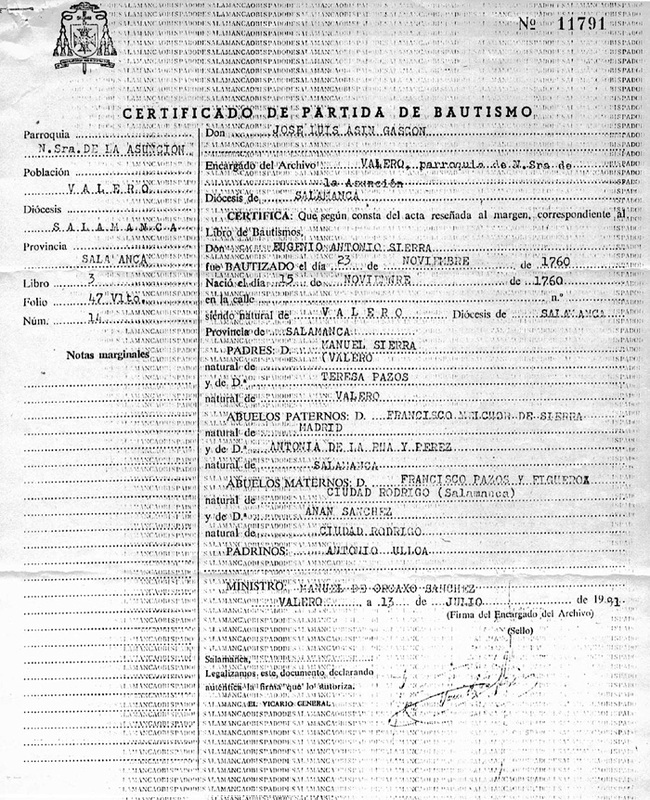 Record of baptism: Eugenio Antonio Sierra, 1760, Certificado de Partida de Bautismo for Eugenio Antonio Sierra. Parish of Nuestra Senora de La Asuncion, Diocesis of Salamanca, Province of Salamanca, Spain. Book 3, Folio 47 Vlto., no. 14. Copy of certificate and translation provided by descendant Viola Upchurch in 2014 and also by descendant Cynthia Brosnahan Richardson who received a copy from another descendant back in the 1980s.